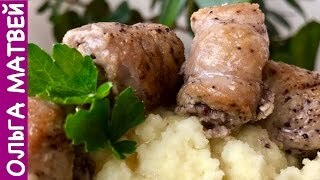 Старинный Бабушкин Рецепт Мясных Пальчиков На Праздничный Стол | Meat Fingers Recipe, Subtitles. Как приготовить? Это коронное блюдо моей бабушки, которое она всегда готовила на большой праздник. Hello everyone! It's an "Easy to cook" channel. Today we'll make meat "fingers".. It's a very tasty recipe. But you need to know several secrets..
We need the pork tenderloin. You can use beef, but pork tastes bettter..
Several pieces of pork fat. And pork meat, it's the best as a filling..
You can take pork as a filling and beef tenderloin, as basis. It depends on your taste..
Also toothpicks, garlic, black pepper and salt. Pork tenderloin must be cut. As I have it from the freezer, i don't defrost it fully.. If you have a fresh meat, put it into the freezer for 1.5-2 hours. It'll be easier to make "fingers"..
Divide the tenderloin into 5-6 parts. It will be the width of the "fingers". It's a perfect size.. If it's not fully defrosted, it's easier to cut.. I used 2 pcs of tendeloin and I have lots of pcs of meat for "fingers". Tenderize the meat..
Tenderize meat from both sides. Each piece must be salted and peppered. Put all the meat into a separate bowl.. While we tenderize and season each piece, others start to marinate..
Cover everything with a cling wrap. Let it marinate. Let's make a filling..
Cut the meat into pieces to mince. Take some fat also, it'll make the meat juicy..
Meat, fat and garlic should be minced together..
Add some black pepper. If you like spicy filling - add more..
Add salt and mix everything..
Let's make the "fingers" now. Take a piece of tenderized meat. Take some filling with a teaspoon.Don't take too much..
Take a large knife. Roll the meat to make a "finger". Excess meat can be cut off.. It's open from both sides. Take a toothpick and fix the edges from both sides.. Put the finger onto the plate or cook-board.. The leftovers can be stuffed too. The "fingers" will be smaller.. If the edges are uneven, start rolling from another side. They will just have a smaller size..
My granny used to wrap them with thread, but it's not really comfortable.. If the pieces are too small, lay one on another, add the filling and roll.Don't forget about a toothpick..
From 2 pcs of tenderloin we have such an amount of "fingers". I also used 1/2 of the filling. For 4 pcs of tenderloin, we need 1 kg of pork..
And another half I'll leave for the next time..
Having 2 tenderloins, you'll have have a portion 2 times bigger..
Take a big frying pan. Add oil and heat it. Put the "fingers" into the pan..
Fry the "fingers" from both sides to make them of a golden colour. But be attentive with the time, not to overdo, or the meat will become dry..
Take them out of the frying pan and put into a separate bowl..
After several minutes , when they cool down, take the toothpicks away.. When they're fried from the sides, the toothpicks can be taken away easily. Take a saucepan with a thick bottom.. Without pre-frying, these rolls won't be so delicious.. If the stuffing is chopped finely with a knife, the taste will be worse. Mincer is better.. Without frying the taste will be worse too..
What I find the hardest, is frying. The oil "shoots" everywhere..
Add water into the saucepan. It should be warm and salty (2 tsp). Add salt as if you make soup..
1.5 L of water - 2 tsp of salt, bay leaves, black pepper. You can add a mix of pepper..
You can add savory, oregano, dry mustard. It's up to you to decide.. I add only bay leaf and pepper..
Cover our meat "fingers" with water. Leave 0.5 cm for meat juice..
After some time the "fingers" will give away their juice, so there'll be more liquid.. It needs 1.5-2 hours to stew.. The filling will get ready quickly, but the tenderloin (especially beef) needs 1.5-2 hours.. The heat should be small. Wait for 1.5 hours..
My slow-cooker has switched off. Let's look at the "fingers". Look at them! I'll put some onto the plate.. This broth can be used later for sauce, or just for heating the "fingers".. I'll cut one. Look at it from the inside. You can't say that they are greasy.. It tastes better with potato..
Add some broth and herbs.. The smell is incredible. It took more than 1.5 hours for them to get ready.. I'd like to try the broth. It's so tasty!. Chewing isn't equired, you can swallow everything at once (I'm joking).. If you use the beef tenderloin - you need at least 2 hours..
Look! Don't you want it?. It can be your traditional dish.. I'm sure you'll like it! Thank you for being with me today. Subscribe to my channel, like the video and enjoy your meal. Bye-bye!